Beginning with Book One in 1950, and continuing through each successive year, it was a decade of monumental discoveries and milestone technology towards the goal of Clear. Here, then, is the Congress that launched the next decade, and set the whole of Scientology towards Operating Thetan. It all followed from the very definition of OT as “knowing and willing cause over all dynamics.” For while all earlier efforts were aimed at clearing people on the First Dynamic, L. Ron Hubbard opened this one with the startling announcement: “What I’ve arrived at this Congress with was how to clear them on the First, Second, Third, Fourth, Fifth, Sixth, Seventh and Eighth Dynamics.” While even more startling was the breakthrough that made it possible: Responsibility and the watershed technology of Overts and Withholds. Here, then, is technology spanning every dynamic from the individual, to marriage, to entire governments. Here, too, is the very long view of the overt–motivator sequence across scores of lifetimes, and why that whole track seems so dim. Finally, here is lecture after lecture, each now legendary in its own right—from Responsibility, Overts and Withholds, Why People Don’t Like You and Your Case. Technology drawn from Mr. Hubbard’s first OT Research, and the crucial make-break of case gain—herein lies the key to responsibility across all dynamics, and hence, your route to the State of OT. The 1950s: Beginning with Book One and continuing through each successive year—a path marked by monumental breakthrough after monumental breakthrough, milestone technology after milestone technology, towards a single goal: CLEAR. 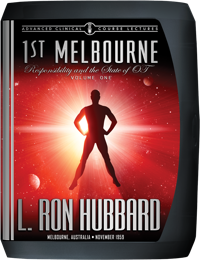 The 1960s: A decade that began with a new and even more glorious goal: OPERATING THETAN (OT). Eternity: When one looks back as an OT to where it began: THE STATE OF MAN CONGRESS. Since the earliest days, Mr. Hubbard had been capable of clearing others. Yet with revolutionary breakthroughs in the training of auditors, they now were doing the same—individual clearing had become a reality. His next target was to make it faster and easier, so that even more could be cleared. In the past year that too had been accomplished, with the means for wide scale clearing of thousands at a time—through co-auditing. And finally, also in 1959, his establishment of an administrative headquarters to serve as a stable base for all future research and the central dissemination center to spread it everywhere—Saint Hill Manor in England. Yet, if 1959 had already seen a storm of activity, then it became a hurricane as he ended the year with a 30-day round-the-world tour to every Central Organization: Scientology had become a global movement. “We’ve been trying to Clear people on the First Dynamic and we can Clear people on the First Dynamic, but they’re not Clear on the Second and Third, let me tell you. 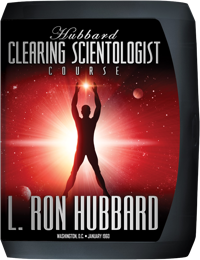 Here, then, is technology which changed the entire thrust of Scientology and which now spans the Bridge from the lowest levels to the highest states of OT. Then again, here is technology that spans every dynamic—from the individual to marriage, and from groups and organizations to entire nations. In fact, here is technology so inherent in what it means to be a Scientologist, it is represented in the upper triangle of the very symbol of Scientology. For here is the breakthrough: Responsibility. And the watershed technology for planetary clearing across all dynamics: Overts and Withholds. “So here we change from irresponsible to responsible, from guilt to strength, and all in the twinkling of an eye. 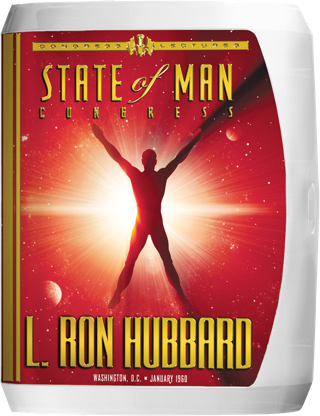 And therein lay the power of what L. Ron Hubbard laid bare at his most famous Congress of all time.